As per the Board of Selectmen’s decision earlier this month, the Mead Park Brick Barn is to be demolished over three days next week, starting Monday, according to First Selectman Kevin Moynihan. Moynihan said during the selectmen meeting that town officials are meeting next week with Evesource to discuss installation of a gas main in downtown New Canaan this summer. “I hope they will do better job this year than last year,” he said. 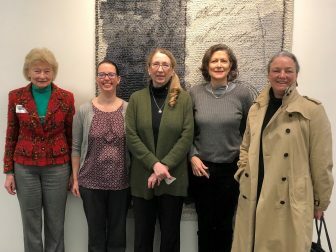 L-R: Mimi Findlay (NCPA), Gretchen Pineo (PAL), Lea Cromwell (NCPA), Rose-Scott Long (NCPA), Neele Stichnoth (NCPA) in Hartford following approval by the State Historic Preservation Review Board to Recommend the nomination of Waveny to the National Register of Historic Places. Representatives of the New Canaan Preservation Alliance on March 22 attended the CT State Historic Preservation Review Board meeting in Hartford to review the nomination of Waveny to the National Register of Historic Places. Review at the state level was the next step in the process of Waveny being added to the National Register. NCPA retained Public Archeology Laboratory of Rhode Island, as consultant to survey all of Waveny Park, research, review, coordinate and prepare the nomination. PAL’s team consisted of experts in the history of architecture, interiors, and landscape, and an archeologist. The nomination was approved unanimously by the State Review Board, including a unanimous vote to raise the significance from “local” to “state”. 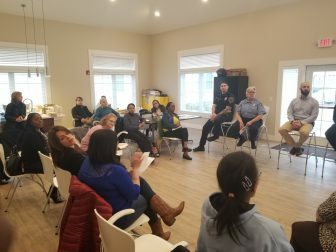 Members of the Crime Watch group at Millport Apartments met Monday with New Canaan Police Sgt. Joe Farenga, Officer Nicole Vartuli and Animal Control Officer Allyson Halm. The officials spoke about community-wide issues such as burglaries, scams, identity theft and a recent attempted abduction of two young girls in New Canaan, organizations say. Vartuli was introduced as a new liaison officer to members of the community, and Halm spoke about the importance of getting dogs vaccinated, leash and licensing laws as well as the town’s pet policy and expectations for pet owners, the organizers said. A follow-up meeting will be held April 22. 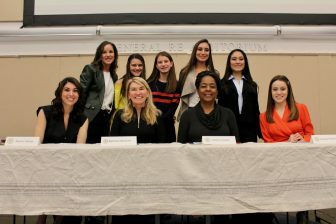 LiveGirl on March 23 hosted a #GirlBoss community event at UConn Stamford that drew more than 100 parents and daughters. Winners of LiveGirl’s #GirlBoss contest presented their ideas “to make the world a better place.” Winning ideas included a beach clean-up recycle campaign, period poverty initiative, and social media campaign (Choose To Be You) to encourage girls to embrace their true selves. Contest winners to be featured in the summer edition of STRONG Magazine for Girls include Isabella Piazza (14, Wilton), Stephanie Guza (17) and Caroline Guza (16), both Stamford and Caroline Taylor (15, Rhode Island). The selectmen voted 3-0 Tuesday to remove April Connor, Payroll/Benefits Administrator, from probationary status to full-time. Moynihan said Connor came to the town from the Board of Education staff. During the same meeting, the selectmen voted 3-0 to approve $26,000 in legal bills from Berchem Moses PC, the town attorney’s firm, for invoices issued in March. The figure includes an $8,500 monthly retainer, $3,313 line item for consultation on an electricity microgrid (which is not to materialize), $2,890 for a suit brought by Grace Farms vs. the Planning & Zoning Commission, $1,903 to review Merritt Village materials and $1,833 for an agreement between the town and New Canaan Athletic Foundation, according to an invoice. The New Canaan Police at 10:20 a.m. Thursday traveled to state Superior Court in Norwalk to serve an active warrant on a 21-year-old Danbury man. The man had been arrested in 2017 on a motor vehicle-related charge. 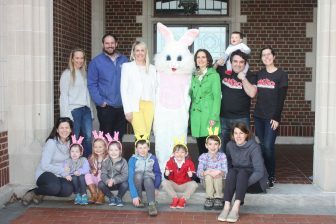 Finally, the Young Women’s League of New Canaan will host the 46th Annual Easter Egg Hunt on Saturday, April 6, with activities beginning at 9 a.m. at Waveny. (The rain date for this town favorite event will be 9 a.m. on Sunday, April 7 at New Canaan High School.) The Easter Bunny’s arrival kicks off the festivities, which include family entertainment, bounce houses, glitter tattoos, Easter crafts, bake sale and themed kid’s merchandise for purchase.